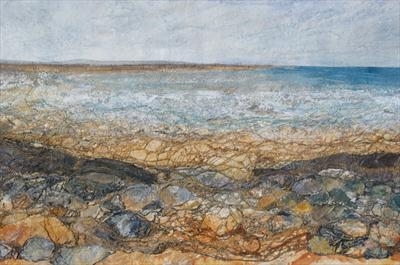 Seascape evoking a rocky shoreline, worked on paper with acrylic and applied free machine stitch. A piece worked from observations of the sea in a sketchbook, worked into a finished piece in the studio, using acrylic paint, mediums and markal oil stiks. A layer of stitch is worked on dissolvable fabric and applied to the surface with hand stitch. Further paint is applied to integrate the stitch into the suface.